Breakfast might be one of the best ways to start your day, but all the pressures of the morning – getting ready, commuting, making it anywhere on time – can make a hearty and filling breakfast a hard thing to accomplish. If you opt to skip this meal or load up with carbs, your energy levels and meal choices can be negatively impacted for the rest of your day. An oven-baked omelet helps you to start with a meal that leaves you satiated, which can help stave off mid-morning cravings and keep your energy levels high throughout your day. 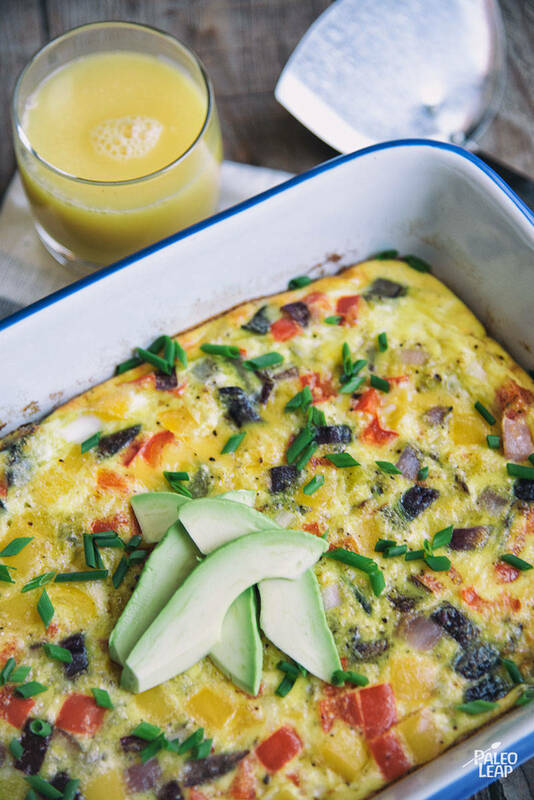 This omelet recipe may seem a little ingredient-heavy for a quick morning meal, but you can save time by prepping your omelet the night before and storing in the refrigerator until you’re ready to bake it – once it’s in the oven, you’re free to get your morning routine done! Eggs are an inexpensive and healthy protein full of awesome micronutrients, protein, and healthy fats. When shopping for these, there’s a lot of debate into what kind to buy since labels can be very misleading. Whichever kind of eggs you do buy – watch for deep orange yolks and cloudy whites, since these indicate the chicken was fed a healthy diet. You might be surprised to see how many local farmers sell eggs – check out your farmer’s market so you can talk to them one-on-one and learn how they raise their chickens. This breakfast omelet is perfect as a stand-alone dish – you can even add some sautéed spinach for additional greens. If you have more time for a really impressive breakfast, serve this with some Paleo pancakes and mixed fruit – a great brunch combination! Melt cooking fat in a skillet over medium heat and cook the bell pepper, onion, and garlic until soft (4 to 5 minutes). Add the ham to the skillet and cook another 2 to 3 minutes. Spread the ham-bell pepper mixture into the bottom of a baking dish. In a large bowl, add the eggs and milk; season with salt and pepper to taste and whisk until well combined. Pour the egg mixture over the ham and vegetables; bake in the oven 25 to 30 minutes.